All this tells us about George BOYLE are the address where his daughter Elizabeth Mary was born, 133 Mann Street, Toxteth Park and his occupation, a carter. So far, we have had no success in finding a marriage for an Ann (Jane) CUMMINGS to a George BOYLE. Our next step was to search for George in the censuses, although without knowing his date of birth, the prospects of finding him didn’t look that good so we were hoping that we’d find them together as a family but unfortunately, we were out of luck. The only George BOYLE in the 1881 census that looked like a potential lead was a seaman on the ship “Bacchante” in South Africa. He was, however, born in Manchester and according to his Navy service papers he enlisted in May 1873 so it didn’t look like a promising lead. * Her name on her birth certificate is Agnes Ann THRELFALL, daughter of George THRELFALL and Ann Jane THRELFALL, formerly BOYLE. The address is the same as the 1881 census: 5 court, Clive Street, Toxteth Park, Liverpool. Agnes died two years later of pertussis (whooping cough). * Although George THRELFALL is named as the father on Georgina’s birth certificate, as far as we can tell, George and Ann were not married. And no father is given on Winifred’s birth certificate. The address on her birth certificate is the same as her sister Agnes’ above; 5 court, Clive Street, Toxteth Park, Liverpool. In 1901, she is staying with her grandfather Andrew CUMMINGS in Seaforth. Georgina married Joseph COUGHLIN in 1903. ** Winifred’s birth certificate tells us that she was born at Walton workhouse. No father is listed and her mother is Ann Jane THRELFALL, laundress of Litherland, a resident at the workhouse. 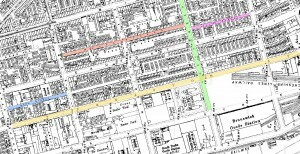 Looking at a contemporary map of the Toxteth Park area, one can see that Clive Street is only a few streets away from Mann Street, where our Elizabeth Mary BOYLE was born. 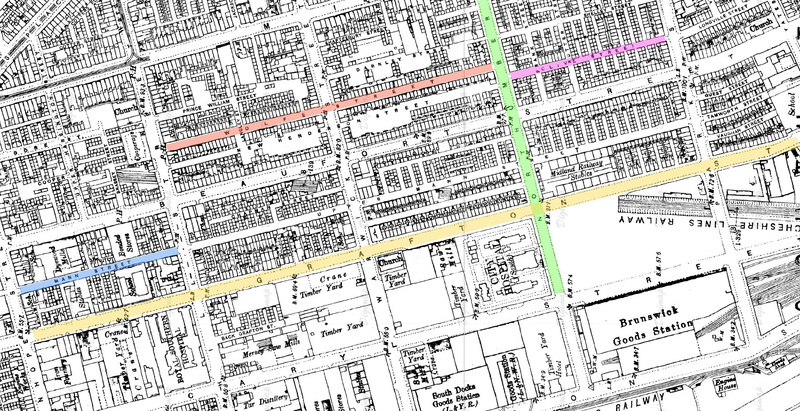 Map showing the streets in Toxteth Park, Liverpool where BOYLE families were living at various times. Sarah BOYLE, wife, mar, 29, housewife, b. Liverpool. So these two BOYLE families are related through Charles P. BOYLE, which means that we have a link between the George BOYLE age 14, born in Monmouthshire, and the BOYLEs who are carters. For me, this makes him a more likely candidate for our George BOYLE than the one we found serving in the Navy, born in Manchester. * George BOYLE, head, mar, 34, gas stoker, b. Newport, Mon. Ellen Maud BOYLE, wife, mar, 24, b. Liverpool. Ellen BOYLE, wife, mar, 34, b. Lanc. Liverpool. Their marriage certificate shows that George BOYLE and Ellen Maud GILBERT married at All Saints, Liverpool in 1884; he was a 28 year old bachelor and his father was Charles BOYLE, overlooker. One important piece of the puzzle that was still missing was George’s location in the 1881 census – that was until Pat Gregory’s determined efforts came up with the answer: he was serving in the Army overseas. Pat had found his Army Attestation papers and the information they contained proved that it was the same George that we were looking for: His birthplace was given as Newport, Monmouth, his occupation was a carter and there was also a reference to his marriage to Ellen Maud GILBERT. Details were also given as to where he had been posted. George signed up in Liverpool on the 20th March 1877 for 12 years of service in the 13th Brigade of the 8th (King’s Regiment) of Foot, later being transferred to the 25th Brigade of the 24th (2nd Warwickshire) Regiment of Foot. According to the papers, George was 20 years of age and described as being 5 feet seven and a half inches tall with a fresh complexion, blue eyes and brown hair. 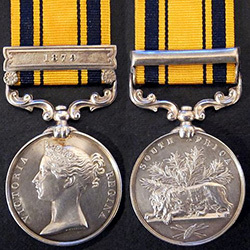 According to his service record, George served in South Africa until 12 Jan 1880. This was towards the end of the Anglo-Zulu war (after the famous battle of Rourke’s Drift). George would have been in South Africa at the time of the final Battle of Ulundi (on 4th July 1879) but from what I can learn, his regiment was held in reserve. He was then posted to Gibraltar until the 11 Aug 1880 after which, he served in Secunderabad, India. He completed his service in 1889 aged 32 and was awarded the South Africa campaign medal. To date, we don’t have a birth certificate for George and although it remains to be proven beyond all doubt, I believe from the evidence we have that it’s the George BOYLE, born in Newport, Monmouth who is the father of my great-grandmother Elizabeth Mary BOYLE/CUMMINGS.